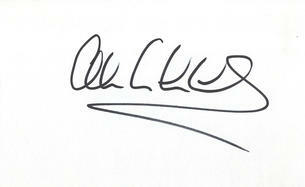 This is an In Person Signed White Card 5.5" x 3.5" by the former West Ham,Birmingham, Aston Villa and Charlton Athletic Footballer and more recently a Manager at Charlton and West Ham. Llewellyn Charles "Alan" Curbishley (born 8 November 1957, Forest Gate, East London) is an English former football player and manager. He has worked in the FA Premier League in management roles at Charlton Athletic and, more recently, West Ham United, the post from which he resigned on 3 September 2008.